A thriving church for every people. Mission | Motivated by the love of Christ, and empowered by the Holy Spirit, Ethnos Canada exists to assist the ministry of the local church through the mobilizing, equipping, and coordinating of believers to evangelize unreached people groups, translate the Scriptures, and see indigenous churches established that glorify God. Global Recordings Network partners with Ethnos Canada, formally known as New Tribes Mission, in various areas and people groups in South America since 2008. Our materials, such as the Saber players, serve as resources to supplement evangelism and discipleship among individuals Ethnos Canada has touched. 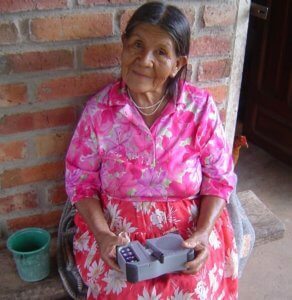 Sabers are especially given to the elderly in the communities, since they are unable to read, so that they may hear the lessons taught in their heart language.